10 years ago I bought some Margaux first growths. Robert Parker had just upgraded the 2000 vintage to a perfect 100 points and I thought that it would be a fitting addition to my cellar. Impatient as ever, I also wanted something good to drink in the shorter term, and so I added three cases of the 2001, rated down at 91-93 points but maturing fast. The 2001 was trading at just under 1/3 of the price of the 2000 when I bought them, which seemed reasonable for the lesser vintage. I still hold a case of each the 2000 and the 2001, and I wondered how much they were worth at today’s prices. According to the Liv-ex mid prices, the case of 2000 now trades at around SFr 10’000 and the case of 2001 is trading at SFr4’425, which feels like the value of the 2001 has risen more than the (100 point) 2000. Surely there would be more demand for the greater vintage? 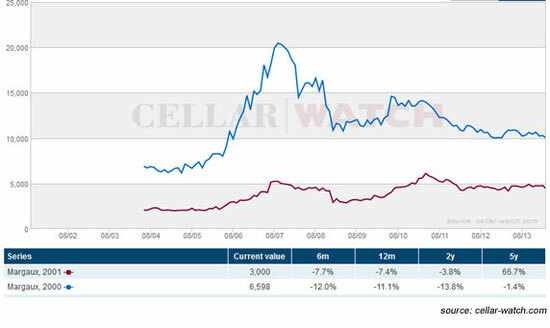 Looking at Cellar Watch, the Liv-ex platform for private investors, it is clear that in 2007 my case of Margaux 2000 had appreciated more than the 2001, but as we sit in 2014 the lesser vintage would have been a wiser investment. Indeed even at the market peak of 2011, the 2001 vintage was outperforming the 2000 by 171% to 106%. The drinking window for the Margaux 2001 is, according to Parker, 2004 – 2020; whereas for the 2000 vintage full maturity is not expected for 30-40 years. This may be a driving factor of the price: the 2001 vintage is getting scarcer because it is drinking earlier, and so as the supply reduces the price increases. So, if you have a holding of some lesser loved vintages, do consider that it may have kept an unexpected store of wealth for you.